One wonders were this will all end up. So far it is a neat toy and has been forever. The practical problem is simply the folding. That is a problem many times more difficult in practice. Yet it seems solvable. Recall that the whole simple topic of fasteners has plagued design engineering forever. It is always a weak point and it has always been a compromise. Expect as much with this toy system. Yet the design is intrinsically strong in the right configuration. So we will see. A versatile origami fold could be the key to creating just about any structure, from the nanoscale to full-scale buildings, according to new engineering research out this week. A team at Harvard says the key is a folding pattern known as the Miura-ori. The pattern uses the simplest mountain-valley fold in origami to tile the plane of a sheet of paper. Miura-ori has been used as a decorative accessory in clothing for centuries and has the advantage of being able to be packed flat and then easily unfolded. "The collapsibility, transportability and deployability of Miura-ori folded objects makes it a potentially attractive design for everything from space-bound payloads to small-space living to laparoscopic surgery and soft robotics," said Levi Dudte, a Harvard graduate student and first author of a paper on the technique. The research builds upon similar work done with Miura-ori by other researchers last year. The Harvard team imagines surgical stents that remain packed flat until inside the body when they "pop-up" into three-dimensional structures, solar panels that can be shipped flat or tables that can be packed out of the way until needed. The researchers conducted their work not by spending hundreds of hours diligently experimenting with folding paper, but by using a computer algorithm to create certain shapes using the Miura-ori fold, then laser-printing the design patterns for physical folding. 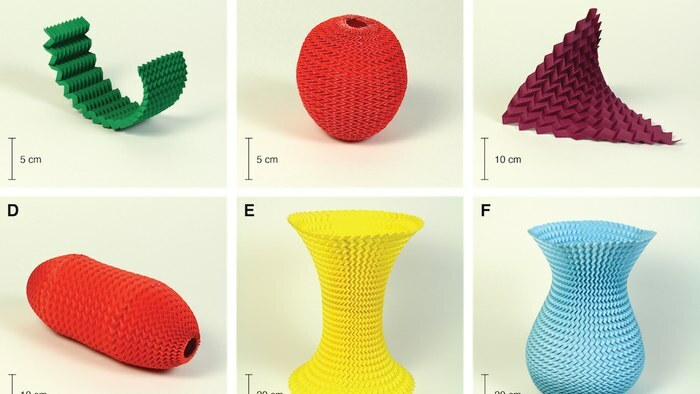 "Essentially, we would like to be able to tailor any shape by using an appropriate folding pattern," explained L. Mahadevan, the Harvard professor who runs the lab where the origami research was conducted. "Starting with the basic mountain-valley fold, our algorithm determines how to vary it by gently tweaking it from one location to the other to make a vase, a hat, a saddle, or to stitch them together to make more and more complex structures." Mahadevan says what is most exciting about the research is that the sky is literally the limit, because it could be applied to materials like graphene that is only one-atom thick or used in full scale architecture and even for structures to be sent to space. The research has been published in the journal Nature Materials. Did An Extraterrestrial Speak To Us? 9 More Virginia Class Submarines? Elongated Skulls Of Peru: Not The Only Ones! WTF Happened to Golden Rice? Was Stonehenge Originally a Roofed Temple? A New Reformation of Religion. Mushy Peas? No. Peas Are Now a Superfood! How Corrupt Is the American Government? Is Your Food Cooked in Toxic Crap?